Cambridge, Mass. — Wyss Institute Core Faculty member Robert J. Wood has been named one of two recipients of the National Science Foundation (NSF) Alan T. Waterman Award. Wood, who is also an associate professor of electrical engineering at the Harvard School of Engineering and Applied Sciences, shares the honor with Scott Aaronson of the Massachusetts Institute of Technology. The annual award, the NSF’s most prestigious honor, recognizes an outstanding researcher under the age of 35 in any field of science or engineering that the NSF supports. In addition to a medal, Wood and Aaronson will each receive a million-dollar grant over a five-year period for further advanced study. "Rob Wood’s research is an intriguing example of the growing interplay of biology and engineering, as well as the power of university research both to advance our basic understanding of how things work and to envision potential solutions to real-world challenges," said Harvard President Drew Faust. "We’re pleased that the NSF has recognized his uncommonly imaginative work." Robert J. 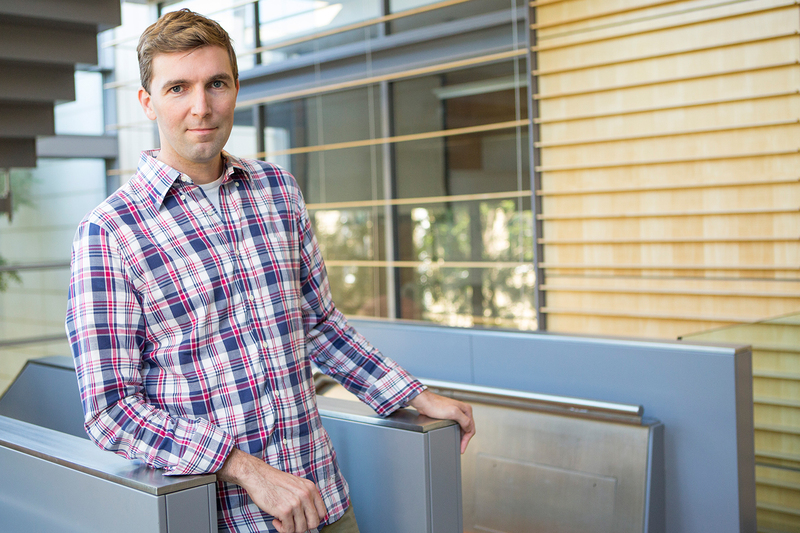 Wood, Associate Professor of Electrical Engineering at SEAS, has won the NSF’s 2012 Waterman Award. Image courtesy of the National Science Board. Wood is a senior collaborator in the Micro Air Vehicles Project to develop coordinated colonies of autonomous robotic bees. He is also working to build agile ambulatory robots that are inspired by insects and centipedes. The long-term goal is to create a swarm of robotic insects capable of performing important tasks, such as search and rescue, hazardous environmental explorations, and pollination. In addition, Wood, together with other Wyss Core and Associate Faculty Members, is exploring soft-bodied autonomous robots and soft devices for human-robot interaction and rehabilitation. One of these projects, called "Second Skin," is a system in which sensing, actuation, and control mechanisms are embedded in soft devices that can be worn by patients with neuromuscular disorders to help them regain function. He is also working on programmable materials that can reconfigure to meet the needs of a desired task. Wood is founder of the Harvard Microrobotics Laboratory, which leverages expertise in microfabrication for the development of biologically inspired robots. His team’s project to develop robotic flying insects received an NSF Expeditions in Computing Award in 2009. A recent aspect of that work resulted in an innovative fabrication technique, inspired by children’s pop-up books, which cheaply and efficiently produces electromechanical devices on the scale of just a few millimeters. "We are all extremely proud of Rob for receiving this prestigious honor," said Wyss Founding Director, Donald Ingber, M.D., Ph.D. "His innovative approach to bioinspired robotics stands out in the field, and his creativity and drive are helping to push this new field of biologically inspired engineering to levels never thought to be possible in the past." Wood is the winner of multiple awards and honors for his work, including in 2008 being named to the TR35 — Technology Review magazine’s annual list of the world’s top 35 innovators under the age of 35 — and in 2010 receiving the Presidential Early Career Award for Scientists and Engineers (PECASE) from President Barack Obama. Wood’s group is also dedicated to STEM education, using novel robots to motivate young students to pursue careers in science and engineering. "I am thrilled to receive this honor and humbled to be in the company of past winners," said Wood, "This award will enable us to pursue novel topics in microfabrication and bio-inspired robotics, along with new application areas for our fabrication techniques outside of robotics. Ultimately this award will also provide invaluable material for our outreach efforts." The Waterman Award will be presented to Wood and Aaronson (who is also an electrical engineer) at a dinner ceremony held in Washington, D.C., on May 3. Both will also deliver lectures at NSF. "Robert and Scott embody the best in young, bold and talented researchers in computing," said NSF Director Subra Suresh. "I have no doubt that these two researchers will continue to have an extraordinary impact on our nation and the world in the years to come."